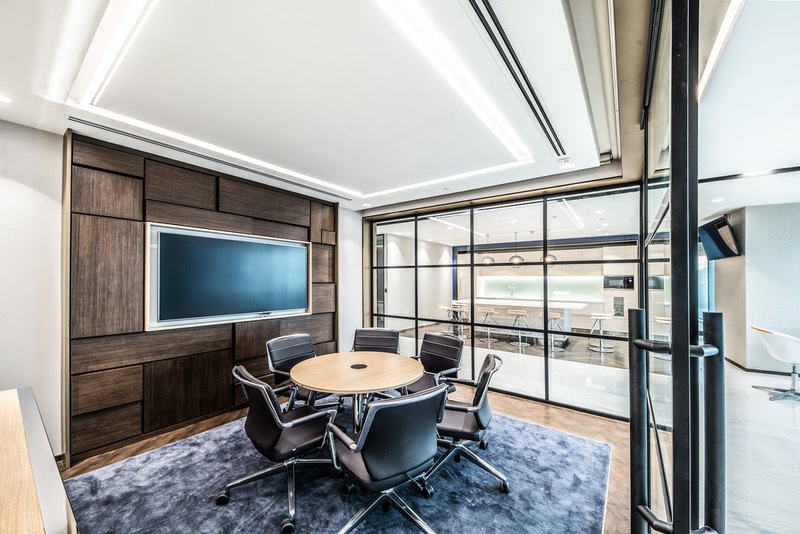 Swiss Bureau interior Design (SBID) has recently completed their first project in Singapore—Emirates National bank of Dubai’s (ENBD) new regional office. The SBID team created a sleek design keeping with the banks corporate and modern branding. Overlooking the waterfront, the property is located in Ocean Financial Centre. The layout was planned in a way that the premium views could be enjoyed both by the bank staff and also the customers. To retain their identity across all their worldwide branches ENBD has certain distinctive design details. 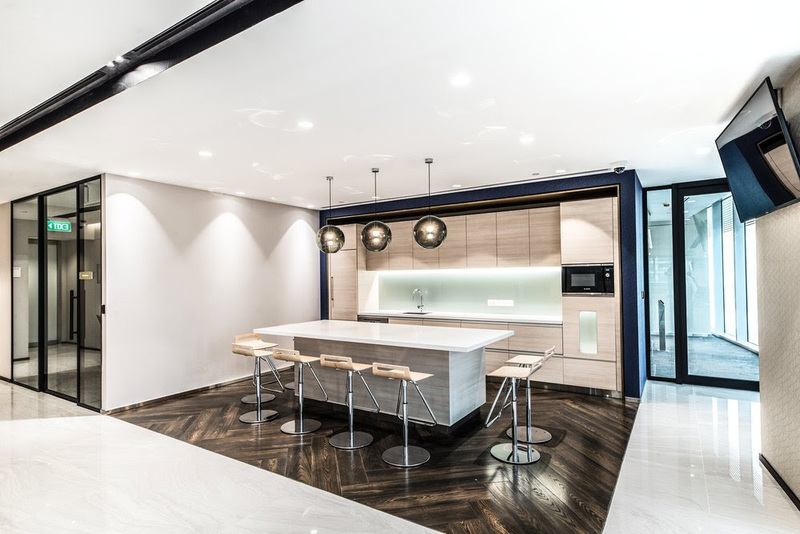 The colour palette is primarily neutral with accents of dark blue, representative of their branding colour. There is a tint of champagne gold in the colour palette which adds an element of luxury to the design. A mashrabiya pattern adds a regional flavour to the design. This pattern is used subtly in the wallpaper and also more prominently in the form of fixed screens that are placed around the meeting rooms, It also forms the basis for the logo wall. A combination of hardwood flooring with a plush inset rug characterises the flooring in the front-end areas. 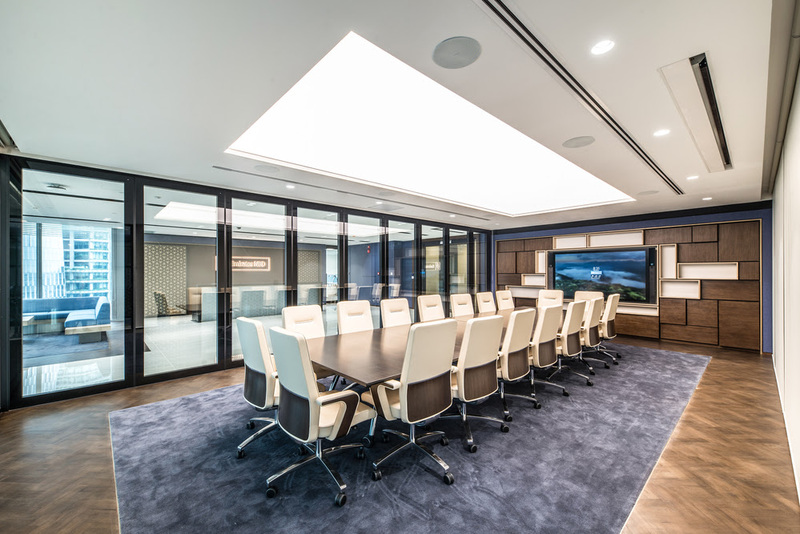 The overall space has been a well-adapted design but also more importantly functional and meeting all the technical requirements to ensure that the overall experience is smooth for all involved.